John Milton used the word “areopagitica,” in 1644, as the title of a speech explaining his concepts of press freedom. It was a polemic to the English Parliament, during England's Civil War, arguing against the licensing, and therefore approval, of printed materials. Milton argued for publication without prior constraint, trusting in the ability of readers to sort out the truth. He argued that truth is found through a full understanding, which demands a full hearing, of all ideas, good and bad, and all assertions, true and false. His argument turns on the assertion that good and bad, true and false, cannot be determined a priori, without inspection by people with similar and opposing views. The idea that truth comes to humans through a tortuous process of distillation is not unique to Milton. It is a common artistic trope, found, for example, in the seemingly incoherent poetry of Robert Burns, as he views facts from many angles, as a jeweler turns a diamond, to measure the refractions and reflections in total. So, the truth is deduced by seeing it beamed through many different mental representations. Milton’s more unique argument was that everyone, layman and scholar alike, should be allowed to participate. “Areopagitica” is, in Latin, the positive, adverbial form of areopagitic, which refers to the Areopagus, the highest court of ancient Athens. Thus, Areopagitica is Milton’s literary invocation of the judicious wisdom of the Greeks, as a positive descriptor of his essay. 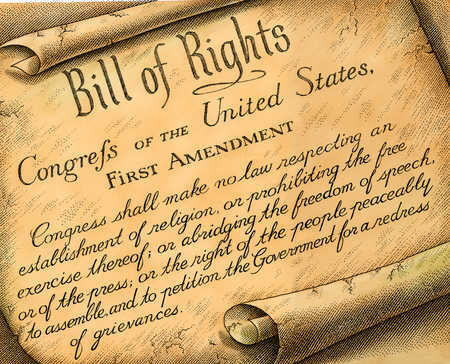 “The Areopagitica” is widely recognized as a foundational argument for the concept of free speech in modern, liberal democracies. The closely reasoned justifications for allowing an unconstrained, public exploration of ideas are cited in scholarly, political, and legal texts. The United States Supreme Court has cited the work by name four times. It has been a special project of educators for centuries. Another, later exhortation toward free speech by John Stuart Mill's “On Liberty,” published in 1859, joins “Areopagitica” as an expansion and clarification of the modern conceit of people thinking for themselves and ferreting out the truth without censorious guidance from the priesthood, either religious or secular. It still animates scholars today. The notion of allowing individuals to freely exchange ideas without a “truth gatekeeper” is fundamental to and virtually synonymous with the idea of democracy. It has evolved slowly, has survived numerous challenges, and continues on probation, needing re-approval from each succeeding generation. The childhood jingle, “Sticks and stones will break my bones, but words will never hurt me,” has taken a long time ascending into practical adult discourse, and is still, under certain circumstances, maligned, attacked and subverted in almost every human institution. A recent survey of American college students found a majority of respondents in favor of prohibiting speech offensive to them. “The Areopagitica” and “On Liberty” were written by scholars, but it takes experience outside the scholarly cloisters to appreciate the depth of their wisdom. Everyone believes in freedom of speech, for themselves. It is the speech of others that concerns us. Many people express their misgivings about free speech with the phrase, “I believe in freedom of speech, but….” After the conjunction they explain why they don’t believe in free speech. Such concerns rest on two perceived problems. First, it is feared people will say things that are obviously false, thus misleading their listeners. Or, second, people will say things so incorrect, inappropriate, and odious that just expressing them is unacceptable. The usual solution is the idea John Milton was arguing against: government licensing of expression. Believing that common people, other than ourselves, are smart enough, and moral enough, to withstand the temptations of liars, and the errors of the misinformed, is a great leap from our subjective self-image to the imagined soul of the crowd. Free speech has been much in the news, lately, in the land of the free. There has been a growing sense that free speech needs to be both defended and tamed, and this conflict has been in evidence on American college campuses. 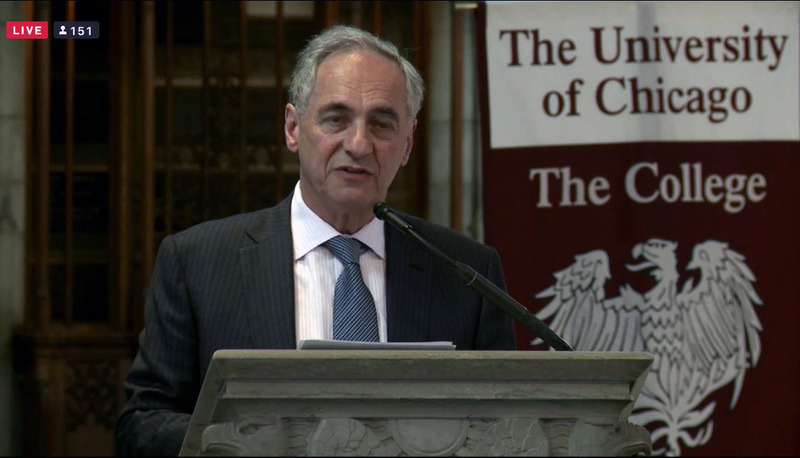 The University of Chicago recently announced its solidarity with Milton and Mill. The Dean of Students, John Ellison, published a letter to the incoming class of 2020, and the President, Robert Zimmer, wrote an Op Ed for the Wall Street Journal. The Chicago Tribune gives us the letter along with student reactions. The whole subject has been much in the news recently. As usual, many are in favor of free speech, for themselves, but suspicious of others. Our concerns about free speech are trussed upon the tension lines between the individual and society. Our society consists of multiple groups to which we belong or with which we interact, with a complexity analogous to the gravity that organizes the universe. Everything exerts a force on everything else, stronger in close proximity, and weaker at greater distances. Just so, we are influenced by family, governments, clubs, associations, social media, entertainment media, employers, and countless others, all exerting their force through expectations, taboos, and constraints. The strongest of the social forces, in most of us, is our personal, subjective view of what we should do at any moment. Finding a way to balance all those forces is the human social problem, sometimes called dilemma, because of the conflicting choices at every moment in every life. It can seem to be a great leap of faith, indeed, to trust that all of us will balance these things well if we are left to our own wits. In fact, it isn’t just balancing them well that concerns us. One overriding fear is that unsupervised individuals will forsake society entirely, condemning all of us to catastrophe. The opposite fear, equally prevalent, is that society will dominate and our individuality will cease to exist, like Lewis Carroll’s boojum. Those two fears are the tension between individual and society. Both “Areopagitica,” and “On Liberty” speak to this wider context, both personal and social, of our human dilemma. Both essays rest on the same underlying assumptions. Free speech is only a good idea if most can be trusted to reason and speak. If we assume only “special” people or institutions can find and recognize truth then, of course, we must ensure significant communications come from them, and other people and groups must be restricted to expressions licensed by them. Both Milton and Mills provide not just an argument for letting people speak their minds, but a template, of sorts, for how to find the truth. They tell us how to perfect this business of living in a society of individuals. It is the templates they provide, as much as the basic arguments, that keep Milton and Mills at the center of any well educated mind, even those who have read little if any of their work. Education is, and ought to be more greatly, influenced by the thinking of these giants. Fads dominate public education as they do all human enterprises, but the centrality of freedom and liberty to the progress of humanity, argue strongly for ensuring that the ideas, if not the words, of “The Areopagitica,” and “On Liberty” find their way into our educational curricula. The current fad of facilitating an exploration of student feelings and self-identity are wise, so long as we remember the underlying importance of using reason to find the truth, and of honing awareness of the feelings of others. Studying Milton and Mills, if nothing more than these two documents, provides an excellent foundation for such an understanding.